On the 9th November 2004, Forrest Badminton Club registered on the, then, Badminton Association of England Club Accreditation Programme with the aim of being awarded the title 'Silver Club, Sport England Clubmark'. Obtaining this title would show that Forrest B.C has been recognised as a badminton club that has addressed the issues of safety, fairness, coaching and management, with the need to provide high standards of each. On the 26th April 2006 Forrest Badminton Club was awarded this title and status, making it the first badminton club in Lancashire to gain the Badminton England Silver Club and the Sport England Clubmark accreditations. The awards were presented on Friday 12th May 2006 to Chairman David Travis and Treasurer / Chief Coach Ray Schofield at the Bolton Arena by Vicky Foster-Lloyd, Badminton England, Regional Development Manager (North) and Phil Howe, Badminton England, Lancashire Development Manager at one of our summer coaching evenings. "These standards required commitment, dedication, and hard work from both the club and the volunteers. It demonstrates you've got strong coaching and effective management in place and that you take equality and child protection issues seriously." All coaches and helpers had full Criminal Records Bureau checks. 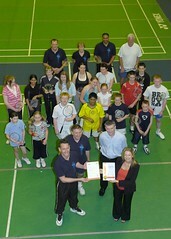 In June 2006 Chris Travis completed the Badminton England Level 1 course. In September 2006 Chris and David Travis completed the Badminton England Level 2, Coach course. More can be found out about Premier Clubs on the Badminton England website here. Below are copies of the certificates Forrest B.C have been awarded in recognition of this 'Premier Club' status including a letter of thanks from a local school the club has links with. Club Future accreditation for Premier (Clubmark) clubs lasts for 4 years. After this time clubs are re-assessed on all areas of the award. Forrest Badminton Club are proud to announce that they have passed the re-assessment and are a Premier Club until January 2015. We are the first club to be re-accredited with the Club Mark standard of a club operating at a good standard. Ray Schofield (Head Coach) is pictured (centre of left hand grouping) presenting Paula Wright (new Level 1 coach) and Christopher Travis (new Level 2 coach) with their certificates. 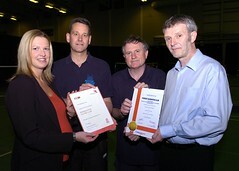 David Travis (Chairman) (left of right hand grouping) was responsible for Forrest Badminton Club attaining Clubmark re-accreditation with Badminton England. David also took the opportunity to present the Club with a donation of £250 from The Royal Bank of Scotland Group where he works. The Banks charitable foundation awards grants in recognition of their staff volunteering their services in the community. David is Chairman, Level 2 coach, and Child Welfare Officer.